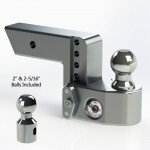 Tow Vehicle Receiver Ball Mounts,Locks, Steps and Accessories. Stow your balls under you truck when not in use. 6, 8 and 10 inch models available in black, mossy oak camo, or with the famous browning logo. All the accessories available here as well. From the original Rapid Hitch to the Alumistinger drop bar, we have the rapid hitch products and accessories you want - including the greaseless ball system. Coupler, Receiver, Fifth Wheel King Pin and Gooseneck Locks.